A boy, slight and quick on his feet, runs up a hill close to his house in the jagged Karoo landscape. The hill is steep, and the days are hot, but he does this every morning. 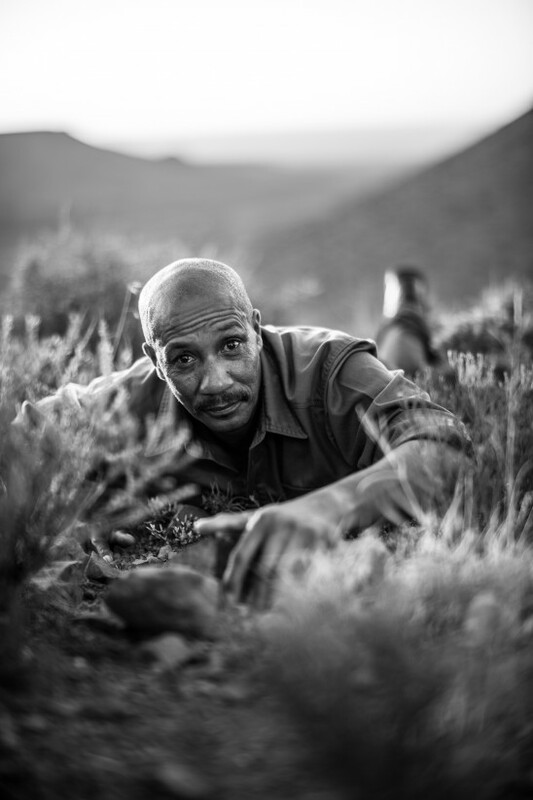 His daily routine: running tracking, and looking for the caracals that prey on sheep. He is Karel Benadie, and today, forty years after those morning runs up the hill, that young boy has become a master tracker – a rare distinction. Benadie, in addition to having earned the title of master tracker, is active in passing on his knowledge. He works now at a game reserve in the Eastern Cape, training young people from disadvantaged communities in the art of tracking. He spends 1500 hours in the field with his students over the course of a year, working with them during the first half of the day. In the afternoons, they are taught theory by his wife, Janetta, also a member of the academy. It is important work, and successful. The knowledge that Benadie possesses is vital to conservation, as efforts to protect and reintroduce endangered species would fall flat without the work of trackers on the ground monitoring the animals and protecting them from poachers. Through his teaching, Benadie is ensuring that his skills are not lost, with immediate benefits to his students as well as the conservation community: over 90 percent of the tracker academy’s graduates find permanent employment in the industry. At the age of fifteen, he was recruited by South African National Parks when the farm that he lived on was absorbed into a protected area. Initially employed as a fence-checker, his knowledge and skill was soon recognised. He was moved to game ranging, and his budding expertise was honed into mastery of the ancient craft of tracking. Working at such a young age meant that he was not given a formal education: he is one of the most highly-skilled individuals in South Africa, with an encyclopaedic knowledge of medicinal plants and wildlife patterns, and he has not completed school. His knowledge has been earned through long, tiring work that can become dangerous in an instant. Rhinos are enormous, and capable of serious destruction when threatened and moved to anger. Benadie, while with two students, once stood up to one as it charged towards him; using only twigs and leaves, he created enough confusion to allow himself and the students to get away. “After that I was so scared. I was shaking – not outside, but inside I was shaking,” he says. The Karoo is an inhospitable place. It is hot during the day and freezing at night. The landscape is full of rocks and the terrain is, one would think, nightmarish for a tracker. There is precious little sand, and the plant life is dry and brittle. Instead of following paw prints and scratched leaves, Benadie has learnt to follow disturbed stones and broken twigs, to look for signs in the land that point to the possibility of a trail, rather than a trail itself. A large part of this art is abstraction, and takes place in his mind – Benadie prides himself on being able to think like the animals he follows, to anticipate their movements when physical evidence is lacking. When he talks about this, his hands are as animated as his face, mimicking the soft, light padding of a leopard or the sharp hooves of a kudu. He struggles to express himself when speaking in English – it is his second language– but comes into his own when talking about his craft or pointing out the signs of a trail. This is where it becomes obvious why he has earned the title ‘master tracker’: his mind is fast, certain, and filled with knowledge of the bush. The day that he was born, 24 July 1963, was freezing – the coldest in Beaufort West’s recorded history. The nearby mountain peaks were covered in snow, and a derivative of the Afrikaans word for it, ‘Kapok’, became Benadie’s nickname, Pokkie. That’s the name that he has gone by for his entire life, preferring it to Karel. At the age of 27 he met the man who would become his mentor, Louis Liebenberg. A scientist who specialises in monitoring wildlife, Liebenberg is part of the tracking community, and identified Benadie as an individual with immense skill and knowledge. They formed a partnership centred on Benadie’s abilities and Liebenberg’s scientific background, and began to work on research projects together. Karel Benadie has worked for years with very little recognition outside of the tracking community, acquiring knowledge that is growing increasingly rare as the years pass. His ability to acquire and retain information is up there with the world’s most celebrated intellects, but because of its unusual nature receives minimal attention. Another factor in Benadie’s lack of acclaim is his own personality: his skill as a tracker is matched by the depths of his humility. His value to South Africa and the world is unquestionable, and his contributions as a tracker and an educator to the field of conservation have been enormous. He has never asked to be celebrated, and prefers to let his work speak for him, but that doesn’t mean he should be overlooked: his story is one that everyone should hear. As a part of this, Benadie spent fifteen years following black rhino after they were reintroduced to the Karoo National Park, recording their movements every day in order to better understand their needs for the purposes of conservation. Benadie would spend long stretches of time travelling across very difficult terrain on foot tracing the movements of the rhino. Together with another tracker, James Minye – one of the only other master trackers in the country – Benadie’s data was published in the scientific journal Pachyderm, going a long way towards proving the value of his work as scientific endeavour. This entry was posted in 4 The Art of Tracking and tagged CyberTracker, Karel Benadie, Louis Liebenberg, master tracker on 2014/01/19 by Louis Liebenberg. Animal Counting Toolkit: a practical guide to small-boat surveys for estimating abundance of coastal marine mammals.